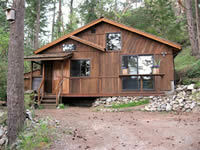 Our MUD BAY CABIN offers you quality accommodations on the peaceful south end of Lopez Island. Our garden has been chosen for the Lopez Island Garden Club Tour. You are welcome to sit in and enjoy our garden with native birds, butterflies, and dragonflies seasonally. We want your visit to be quiet, peaceful, and rejuvenating. We have a pastoral view with great sunsets. Your stay will be in walking distance to three great beaches and near Watmough Bay and Iceberg Point, part of the San Juan Islands National Monument. 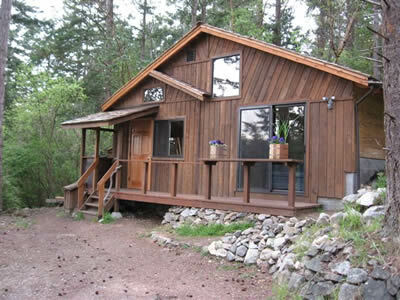 Consider our cabin for a peaceful winter retreat - great for writers, artists, and folks who just want to get away and relax! See our Special Winter Rates. 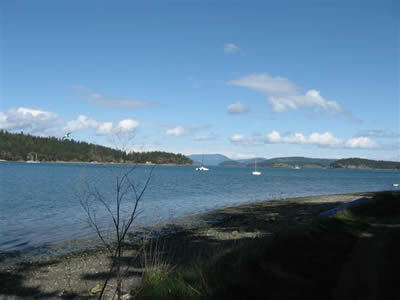 Lopez Island is a beautiful place and far away from the stress of busy city life. Enjoy sailing, kayaking, bird watching, biking, fishing, hiking, and great scenery. In addition our island offers all major services: grocery store, post office, great restaurants, deli, espresso shops, bakery, winery, bookstore, bank, clothing store, and art galleries. Contact our Chamber of Commerce for specifics.